Oil paint, mostly made by kneading together pigment and drying oil that sets the pigment in place, features a distinctive luster and transparency that only oil can create, a degree of plasticity that enables expressive touch and piling, and a gradual drying speed. The ingredients of oil paint fall into three main categories: the pigment, the main vehicle (medium), and auxiliary agents. There are two basic types of pigments, which create the color of the paint: inorganic pigments, made with things like mineral ores, dirt, and metals, and organic pigments, made with dyes and coloring. 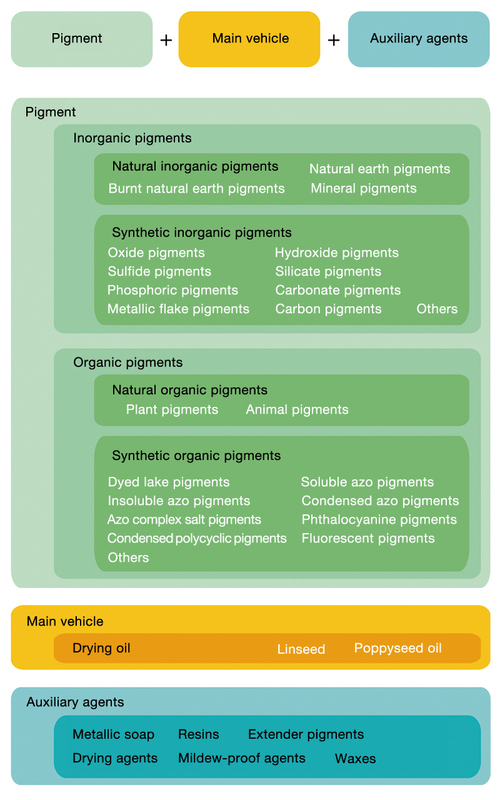 Both categories include natural pigments and chemically synthesized pigments. Inorganic pigments keep well and produce colors with considerable hiding power, while organic pigments generate strong colors with high transparency. 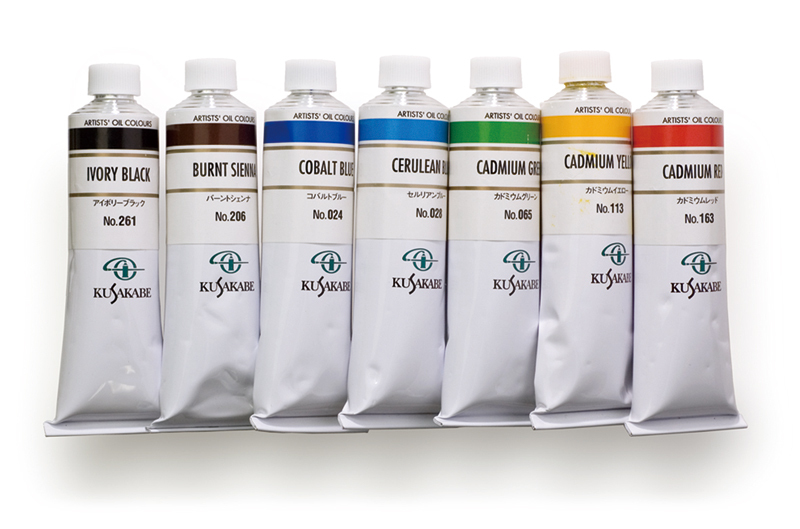 The main vehicle is the ingredient that fixes the pigment to the canvas or other support medium. Materials commonly used for main vehicles include linseed oil, poppyseed oil, and other “drying” plant-derived oil. Unlike the main vehicles for watercolors (gum arabic, etc. 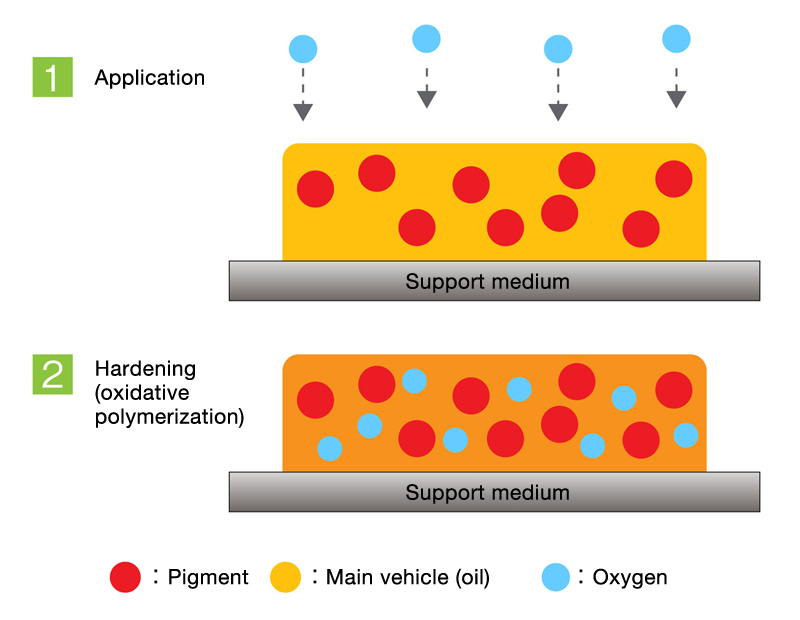 ), which fix pigment to a surface through the evaporation of moisture, drying oil takes up oxygen to trigger a chemical change that hardens the material; this means that the volume of the paint stays the same during the fixation process. Auxiliary agents refer to drying ingredients that speed up the paint hardening process (metal soap, resin, etc. ), viscosity-regulating ingredients that allow for piling and touch (beeswax, etc. ), and ingredients that prevent the formation of mildew. For drafts and the beginning stages of paintings, artists usually put a bit more volatile oil in their oil paint in order to improve drying performance and stretch. Although it is possible to do the actual painting with paint alone, adding a mixture of drying and volatile oils not only gives the paint better stretch and luster but also lets the artist dilute the color for layering purposes and apply colors in a more fluid fashion. As your painting nears completion, you should make sure that the oil dipper contains a larger proportion of drying oil. The technique of kneading together pigment and oil to create color materials (oil paint) is believed to date back to the 15th century, when Flemish painters (particularly the van Eyck brothers) began to use the method. However, the idea of applying oil ingredients over pigment has origins in the time before the Common Era. Artists should note that some oil paint pigments contain harmful ingredients and can change color when mixed with other colors. 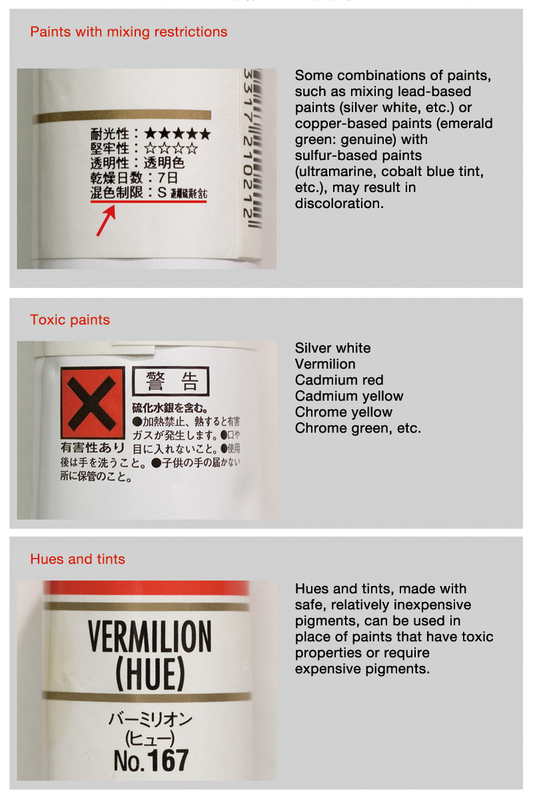 Before using an oil paint, read the warnings and precautions on the back of the tube. Also note that you can use paint remover or a similar solution to remove hardened paint from brushes and palettes. Oil paint is available for purchase at general art supply stores. Points to keep in mind when mixing and handling oil paint There are many warnings and precautions on oil paint tubes. Make sure to read them carefully before using the paint.